I've seen many golfers mark center lines on their golf balls. These lines are supposed to help line up your putter and ball to the hole, making it easier to aim. I'm not a real fan of them. I don't doubt they work, but I've got enough going on in my mind without having to wonder if this "line" on my ball is in a perfect line with the cup. If I miss the putt, was my "line" off? Was it a bad read, or a bad stroke? Probably a bad read or stroke. Line drawing tools retail for $4.50 to $19.95. 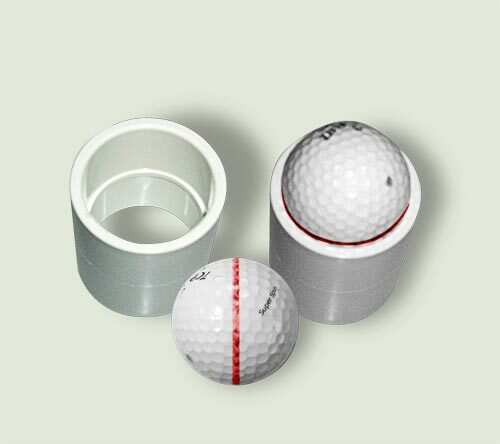 If you want to draw guide lines on your golf balls, try making your own tool, before spending the bucks on one. Well, technically we aren't "making one", but rather, adapting an existing product. A USGA regulation golf ball fits perfectly on either end, exposing exactly half the golf ball. Draw your line around it with a permanent marker. DONE! You can actually mark two balls simultaneously, since the coupling has two openings, but, hopefully, you're not in that big of a hurry. Enjoy these products knowing that you are purchasing from the largest golf accessory store in the world.